There are those who assert that the greatest invention in the history of humankind is the wheel. Then there are the more pragmatic who point out that even more significant was the invention of the second wheel. And it's this notion of reinventing the wheel that, while a boon for cyclists in a hurry, can cost valuable time when mixing a track in a hurry. Come mixdown, a common enough approach is to flatten the EQs, set all effects and other processing to neutral, zero the faders and start from scratch, effectively embarking on reinvention. Naturally, the experienced engineer or producer will have a few tricks up his or her sleeve and will rapidly deploy them as the programme material dictates. If it's a rock track, application of the ideal EQ, compression and ambience for the drums will be second-nature. A wafty ballad may demand a particular reverb on the vocal and, if the singer is an X Factor winner or other B-list celebrity, there'll be the immediate lunge for an auto-tune insert. Such experience, typically arrived at through trial and error, is hard-won, but pays dividends when rushing a production to market. For the inexperienced, or the project-studio pilot wanting good results fast without having to absorb years of sound-engineering lore, wouldn't it be handy to have preset production techniques instantly to hand? Rather than doing battle with an incomprehensible 30-band graphic EQ, suffering compression depression or wracking one's brain in search of the right reverb setting, how about instant track processing that's just the ticket and within easy actuation via a few mouse-clicks? 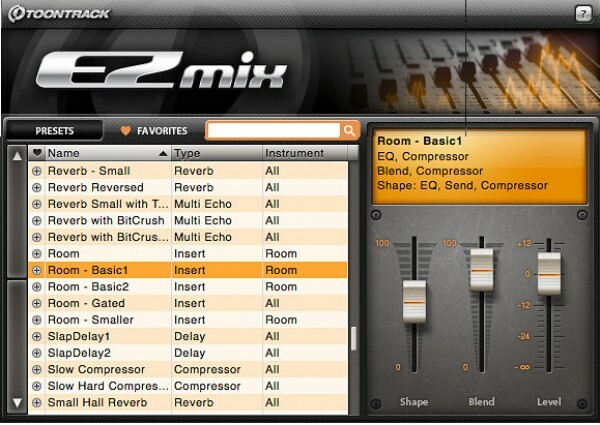 Enter Toontrack EZmix, a VST/AU/RTAS plugin for Windows and OS X developed in conjunction with renowned DSP developer Overloud and engorged with the collective experience of a small army of audio engineers. As you'll have noted, EXmix's interface is uncluttered and clean. At left, the presets are listed with meaningful names and suggested applications, along with a search function and the means by which to create your own favourites' list, while at right we've an information box detailing which components comprise the preset. Below that are three faders: Shape, Blend and Level, all of which can be controlled via MIDI from the host DAW. The latter two faders are self-explanatory, so I'll explain them. Blend enables you to adjust how much of the wet signal is present, or may be assigned to another setting such as, say, compression amount depending on the preset. Level is handy when taming an overloud distortion setting, making up gain when a compressor is engaged and generally optimising output level to avoid under or overloading the mixer channel. There ya go. All 16 processors listed, each with a brief description. Right-click to download. 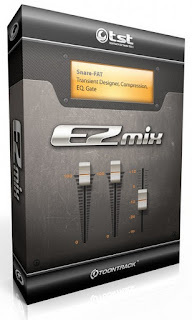 In fact, EZmix is a download-only product, despite the mocked-up box shot at the top of this post and in the UK, you'd head for distributor Time+Space to get yours. Installation and authorisation is simple enough - on first loading the product you're challenged to enter a code and copy/paste the response code into a dialog to get things up and running. You have to be connected to the internet for that bit. As for deployment, typically you'd assign such effects as Echo and Reverb as Sends, whereas Insert assignment would be more relevant to the Bit Crusher, Limiter, tonal enhancement with the Overloud component and applications of per-channel Tape Simulator, Chorus, Inverse Reverb, Distortion and the like. 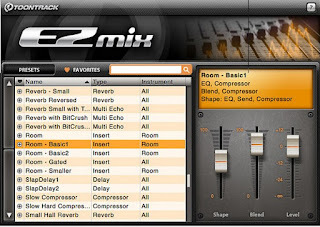 I'd like to conclude by saying that EZmix is an invaluable tool for those in a hurry and for denizens of project studios more intent on getting the composition nailed than poring over the finer points of pre-delay, tweaking low-pass filters and inducing wow and flutter. The treatments available are well up to the mark for demos, rough mixes and some may even make the final cut. You wouldn't expect top-whack processing at the modest price point, but should be more than pleased with what does emerge from the monitors. Yes, that's how I'd like to conclude. But I cannot, because the story doesn't end there.